Sjögren's (pronounced SHOW-grins) syndrome (SS) is a chronic, autoimmune disease in which white blood cells attack and destroy the moisture-producing glands, causing decreased production of saliva and tears. It was first identified by a Swedish physician, Dr. Henrik Sjögren in 1933. Although the hallmark symptoms are dry eyes and dry mouth, Sjögren's syndrome also may cause dryness of other organs. It may also involve the kidneys , GI system, blood vessels, lung, liver, pancreas and the Central Nervous System. Many patients experience debilitating fatigue and joint pains. Symptoms may wax and wane. Some people experience mild discomfort, other suffer debilitating symptoms that greatly impair their quality of life. When Sjogren's syndrome appears along with another primary disease like Rheumatoid Arthritis, Lupus (SLE) or Scleroderma, it is known as secondary Sjögren's syndrome. If you are a SS patient, a family member or friend - Remember YOU are not ALONE!! Join Sjögren's India today to overcome SS through a better understanding of the disease. You can send us your queries and comments. You may speak to us on phone for guidance and counselling support. Join our Patients' Meetings to interact with other patients. With a positive attitude and "Lifestyle management Tips" from our experienced patient volunteers, you will be able to "Live Well with Sjögren's syndrome." 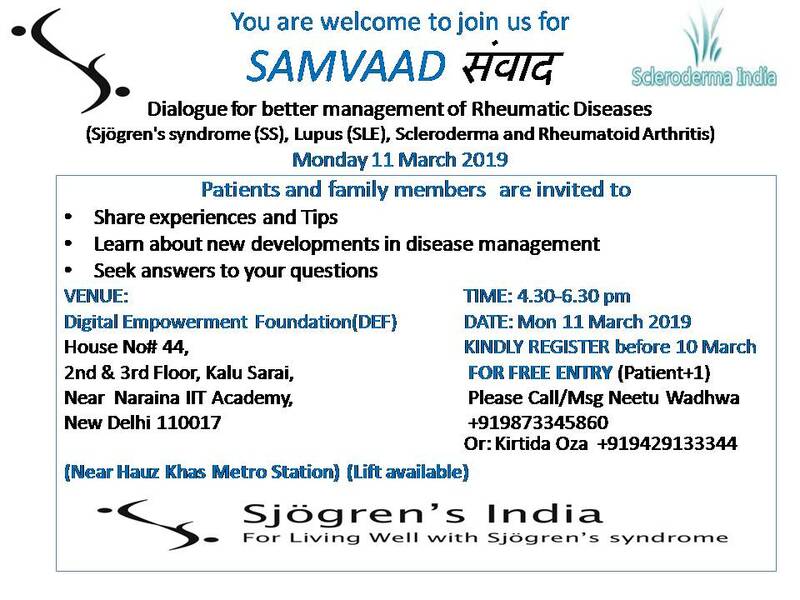 SAMVAAD - संवाद Dialogue for better management of Rheumatic Diseases. Dr. Sapan Pandya MD DM (Clinical Immunology and Rheumatology) talks about the challenges and hope for better management of Rheumatic conditions. Early dia﻿gnosis and ﻿proper treatment can greatly improve the quality of life and prevent serious complications.